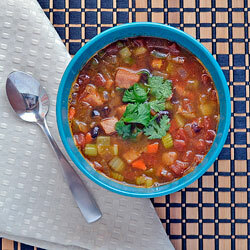 Black beans are used in soups, stews and a variety of dishes and are most common in South America, Mexico and the Caribbean. 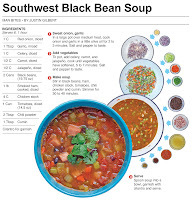 The black bean was once used for a very macabre purpose in an incident when Texas was an independent republic in the 1830s and 1840s. 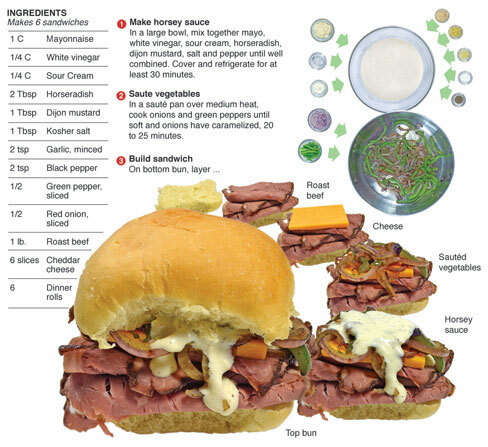 This is my favorite type of recipe to create for my food column. 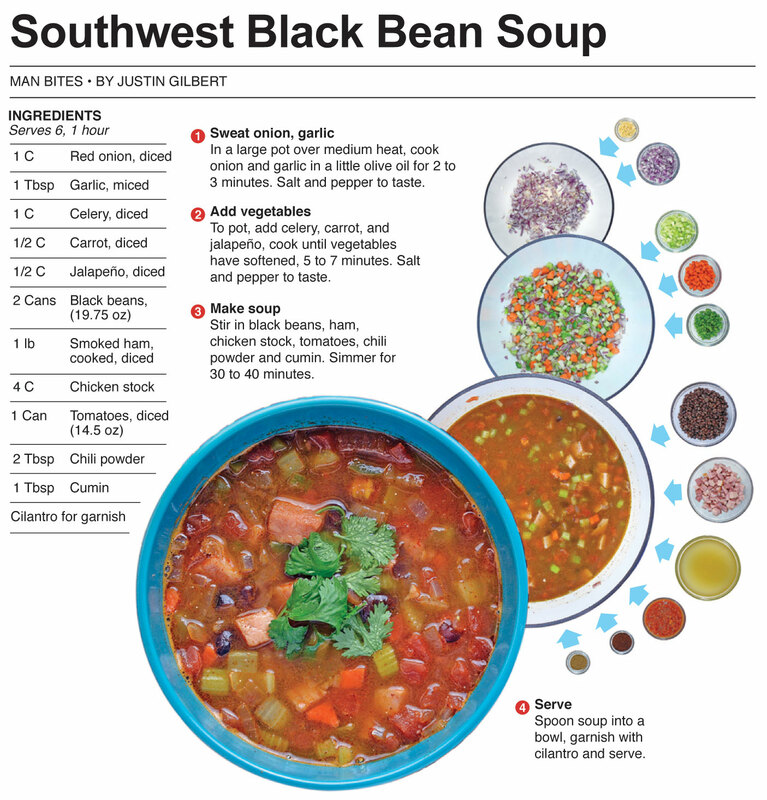 It's a one pot dish and, most important, the black bean has an interesting story. I had completed all the documenting and design and through research I stumbled upon "The Black Bean Episode." I like telling my personal stories about dishes when it is pertinent to the recipe, but a history lesson is my favorite kind of story to tell. 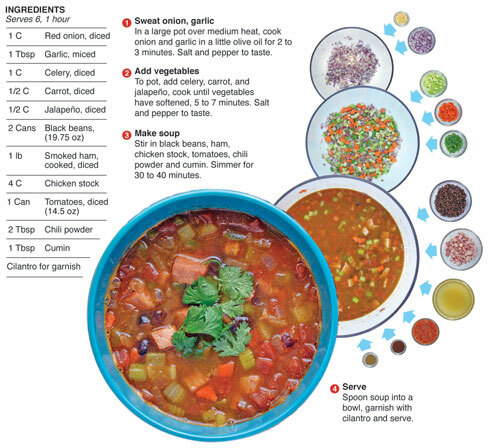 The dish itself is a soup that is seasoned similar to chili. In fact, my Mom thought it was a chili when she first tried it. I call it a soup because that is how I built it. It is a cross between the two though - I guess you could call it a chiloup, or maybe even a sili. I remember going out to eat with Mom and Dad when I was a kid and seeing a new item at a local diner that I had to try: The breaded cheeseburger. It was a beef patty and slice of cheese encased in a shell of crispy breading that was deep fried and served hot. The breaded cheeseburger was delicious, but it was literally dangerous to eat. The cheese was inside the breading so it was molten hot when served. A huge first bite would send scalding cheese all over your mouth, so it had to be eaten with caution. My Dad learned this the hard way. 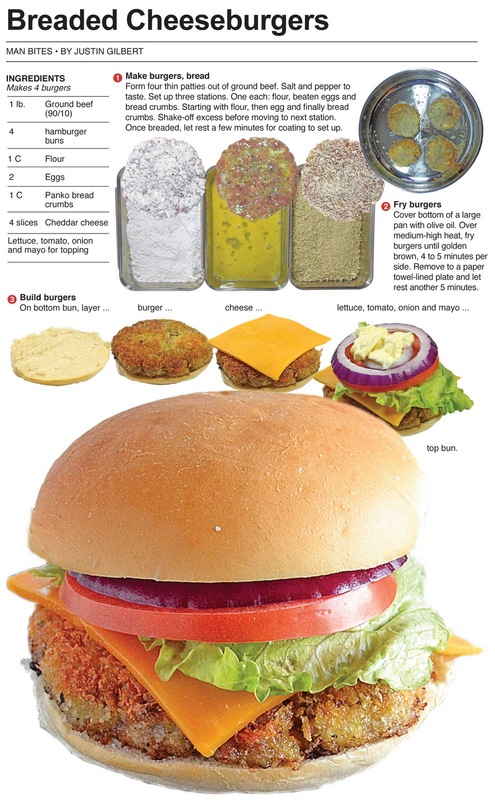 For this recipe, I make my own version of the breaded cheeseburger I discovered in my youth, but I add the cheese after the patty is breaded and fried to avoid third degree burns. 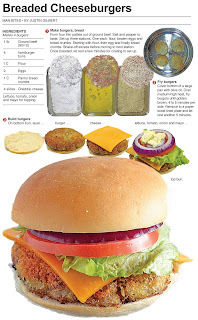 I shallow fried this version in olive oil, so in order to cook it through I had to make the patty much thinner than a normal burger and I use extra lean ground beef to cut down on the amount of grease. 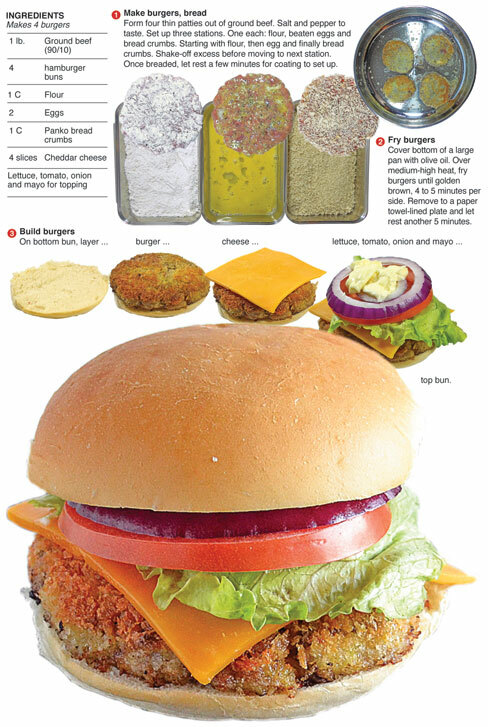 The crunchy breaded patty creates a unique burger experience and I highly recommend any burger aficionado try it at least once. 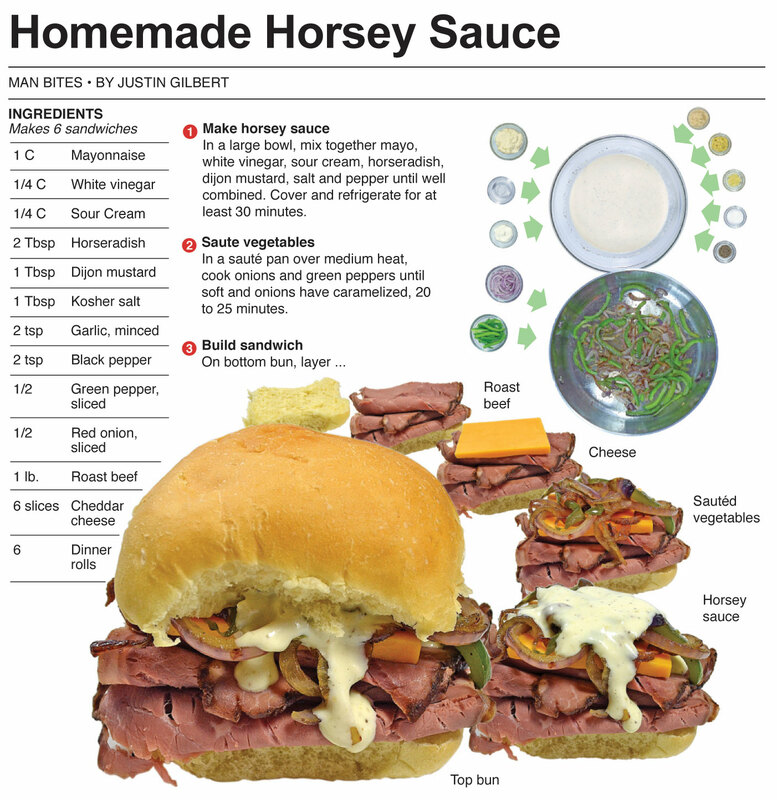 I'm planning on revisiting this recipe in the future. 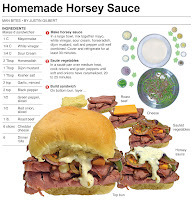 It turned out delicious but I think this concept can be explored further. I presume that when these are made in restaurants the patties are frozen or pre-cooked. 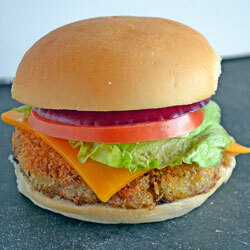 It was a challenge to cook the burger medium before the breading would burn. I overcame it by making the patties thin, which worked but made the beef less prominent in the overall taste of the burger. I think that could be improved greatly. I made four sandwiches originally and topped one with just cheese, pickles and mayo. This brought out more of the breading flavor, but in the end I preferred the traditional LTO and decided it was best for the flavor of the overall recipe. I did some browsing on the web and found that like the breaded tenderloin, the breaded cheeseburger is kind of an Indiana original. I guess us Hoosiers like breaded meat sandwiches as much as we like corn and basketball. 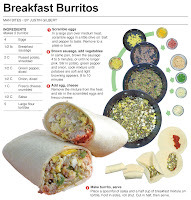 The first time I ate a breakfast burrito was at McDonald's after they were added to the menu in 1991. I thought they were great from the beginning and it is the item I choose most when I start the day with breakfast at the golden arches. A friend of mine used to eat them everyday. He would order from the drive-thru, get three breakfast burritos and devour each one like a maniac in three bites. I wondered if he was secretly training for a burrito eating competition. 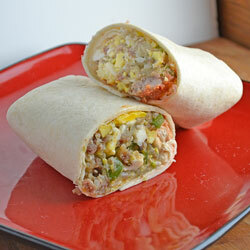 For this recipe, I make my own version of a breakfast burrito. These are much bigger and hardier than the diminutive snacks sold at McDonald's, and will take more than three bites to eat - unless your an NFL linemen. 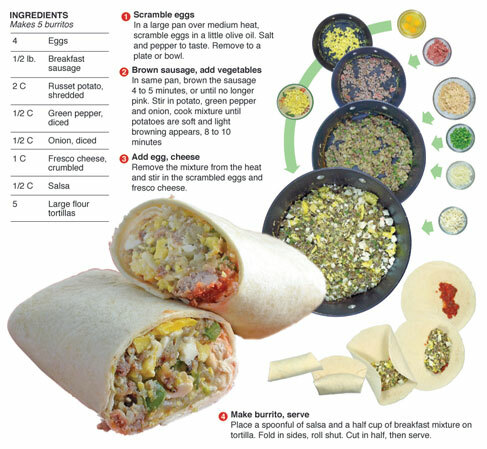 The burrito filling features shredded potato, fresco cheese and other traditional breakfast ingredients. The potato gives it a stick-to-your-ribs quality and the fresco cheese (labelled "queso fresco" at the supermarket) provides a fluffy compliment to the egg, and is similar in texture to feta cheese but very mild in flavor. The friend that I mention in the intro – who ate McDonald's breakfast burritos in three bites – had another interesting fast food quirk. He never went into fast food restaurants when he was by himself. He would order at the drive-thru, then pull into a parking spot and eat in his truck. I always thought that was odd. At the time, he and another guy I hung out with, were what I called "eat in the parking lot alone guys" (with mullets) I used to poke fun at them because of it. (the eating habits, not the hair-do) I hate to eat in my car. Some people do it all the time, but for me, I'd rather slop my Big Mac special sauce all over a table I don't have to clean, rather than the steering wheel of my Honda Civic. I can understand though. Some people don't want to sit in a public place alone and eat. It's an insecure thing. Kind of like people who can't drive twenty minutes by themselves in a car without calling every person in their contact list – just so they don't appear to be alone or without friends. I haven't spoke to the three-bite-burrito-eater in years, I moved to New York and he to Utah. Last I heard, he married a woman named Tangerine. I hope he is doing well because he was a good guy, and a great friend at the time - even though he ate in the parking lot like a wanted criminal afraid of being recognized while eating lunch at a fast food joint. 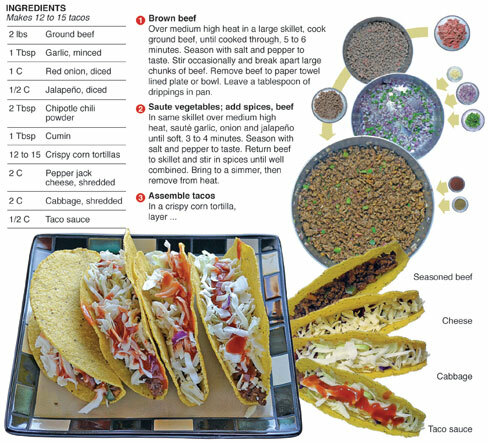 There are many ways to make tacos but I tend to break them down in two ways. The first, which is more authentic to Mexico, is putting most of the effort into a salsa, which will contain all the chili and seasonings that make the taco yummy. The second way, or what I call the American way, is to put the spice and seasoning into a meat mixture. Most Americans making tacos at home buy a kit that comes with a seasoning packet, tortillas and a sauce. The seasoning packet is stirred into the meat with water and simmered until thick. 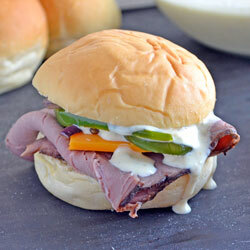 The flavor that the packet provides is easy to replicate with a few items from the pantry. 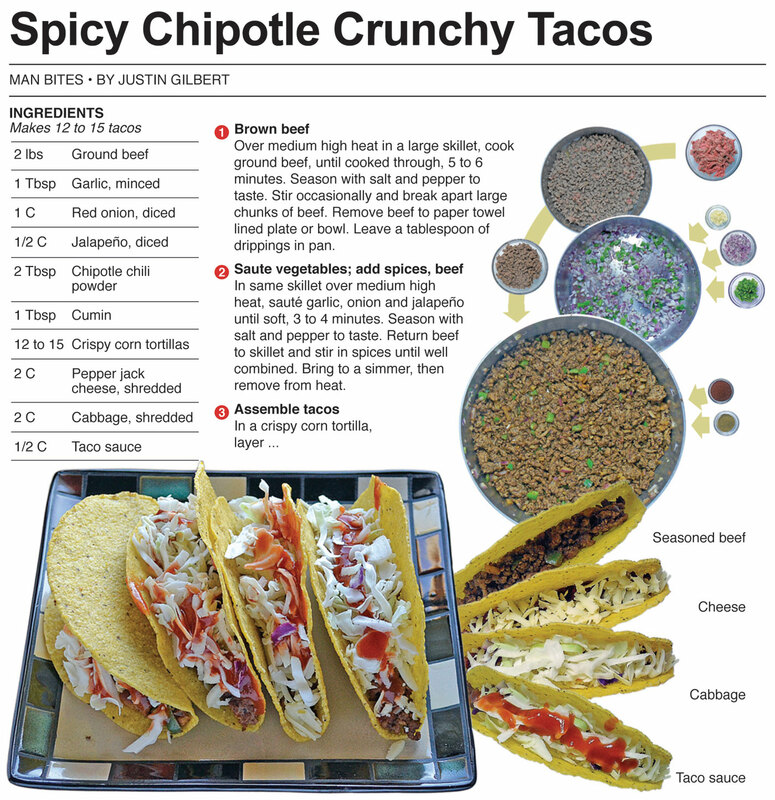 For this recipe, I make tacos the American way, and instead of a packet, I make my own seasoning blend featuring chipotle chili powder, cumin and a few fresh ingredients. It provides the taco with a flavor the packets can’t compete with. 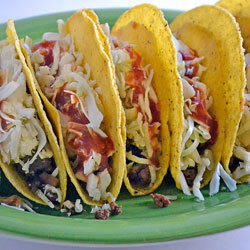 To finish this bold and spicy taco, I add pepper jack cheese, cabbage and hot taco sauce for little extra kick. These tacos make Taco Bell spicy seem like baby food. It's a taco for people who love heat. I like spicy food, the key to eating it and not regretting it, is to limit the amount of spice you ingest. These tacos are perfect for lots of heat. 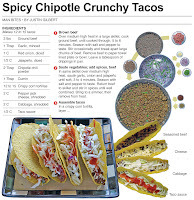 Most of the fire is contained in the meat mixture and you don't need to stuff the taco full with it. A little bit will go along way. I ate four with no side affects. My mom saw the recipe in the paper and she was surprised that I didn't mention how hot they were. I told her that labeling the taco as "spicy" should be enough. You either like the heat or you don't. I have watched cooks on the food network dice up habanero peppers and toss them into salsa raw. That is hell fire heat. I don't know if the cooks actually test or eat all the dishes they are presenting on TV, but to dice up a habanero pepper and throw it into salsa like a jalapeño would make it so hot that 98 percent of the people who consume it would be miserable for twenty minutes from one bite. 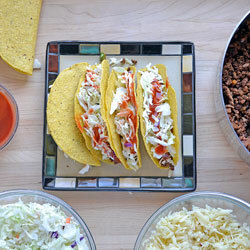 These tacos are far from that kind heat, but they are spicy - in a good way. A friend of mine had a big party a couple of years ago and she asked me if I would be in charge of the food. I made a number of gourmet pizzas and had a salsa bar set up for snacking. Near the end of the cooking, I made one final salsa for people to try. It was a pineapple-habanero salsa that was absolutely mind blowing. I warned all who I presented it to that this would be the hottest salsa they would ever eat. I wanted the salsa to be that of legend. Years from now, when people are telling stories of "that was the hottest thing I've ever eaten" I was hoping they would have my salsa as their story. I warned people and personally escorted the bowl around. About half the people tried it and most agreed that it was the hottest thing they had ever eaten. There was milk and most where able to extinguish the flames with it. I should have thrown the salsa out after the taste test but I put it on the salsa bar and started to mingle. I had been cooking all day and it was time to party. Later on that night more revelers showed up, the people who had been there were talking up the pizzas and salsa, which prompted most of the new patrons to go get samples. It wasn't long before a woman came over to me raving mad. She said "Why would you make something like that! It ruined all the other great food! MY GOD! What was in the pineapple salsa!" I told her I was sorry and went to get her some milk to put out the fire. One problem. All the milk was gone. There were a number of people suffering from the salsa, and I had nothing to extinguish the fire besides beer. It wasn't long before I witnessed someone grab a bottle of french vanilla dairy creamer from the fridge and down it. It was time to throw out the hell fire salsa. It's one thing to know what you're about to eat is mind blowing hot. It's another thing to walk by a table, grab a tortilla chip, and get a mouth full of volcanic lava intended to be the hottest thing you would ever consume – without knowing it! I have retired the pineapple-habanero salsa for now, but maybe I should make a one more batch just to post here on the blog.